Isn't it amazing how developed they are so early on!! Such a miracle. We are currently on #5... at I'm 18.5 weeks along. I cannot believe this is what my little one looks like right now!! I love seeing pictures of developing babies- Thanks for sharing!!!!!!! !!! those photos are powerful how can anyone see them and still not see a living human child? thanks they are what helped me see my errors. Aw that's great! Congrats on the new baby. Yes Congrats! Babies are wonderful! Aww, congrats! Boy or girl? Does this mean you're pro-life now? I know this is off topic, but this is cool! Dont know if they will ship to Uk, Im going to give it a try! Yep. In a few months when I turn 18, I'm going to ask for a few of the shirts and stickers and stuff like that. I hope I'll be able to get some of them. Thanks for the Congrats Everyone!! We are not sure yet. HOPEFULLY we will be finding out this coming monday- that is if baby allows !! If the ???? means "these links don't work" it is probably that they are too long. See the ellipses? (...) in the middle of them? Some of the link is not being represented, and it's not working for that reason. yes it does. i always was but after my ex killed my child i tried to defend her and make it seem alright. many people here helped me see it but i want to give special thanks to ashmarie88, lovingmommyof2, and after i realized i was wrong i would like to thank shiprahagain, tam, concernedparent, christianlott, paddygarcia, thecatholicamerican for the support and advise. sorry it took so long to reply to this question i hadnt checked in here for awhile i needed my space. my ex didnt think she did anything wrong when she killed my baby but she called me the other day crying i guess her friend just had a baby prematuraly that weighs just over 4 pounds and she said holding the tiny baby made her think about our baby. she now regrets what she did and wants to get back together and make another baby!?!?!???????? what is that? oh lets make another baby. that does not bring my baby back murdering beotch. at least she now sees it was wrong to kill my baby so hopefuly she wont do it to another innoncent child in the future. God forgives everyone, because he loves them. I'm sure he has forgiven you (for whatever you did, tho you didn't have the abortion). Those photos really hit close to home, because I cannot believe someone would kill an innocent child for no reason, especially looking like that. THe main point of it is that I am 33 weeks pregnant with my husbands and mines first. When I found out, we were absolutely estatic! It hurts to think of all the children that could have gone to wonderful homes have been aborted... it nearly brings me to tears. We are having a little girl, and her name is going to be Adriana. Beautiful name, and I'm sure she'll be a beautiful girl. Thats cool! I wanted to name my child that if we were having a girl. I learned a lot from this site: http://www.mothering.com/discussions/ I highly recommend it. Congradulations on your baby! If you have any baby/birth questions, go right ahead and ask. I was also suggest borrowing a baby (especially the pre-crawling variety) to play with! I wish I had more experience before mine popped out! Thanks guys, and I helped take care of my sisters little brothers when they were born =)! Why don't you just say "bump"? Because bump does not put the attention on the info. SSSSOOO I repost the info. The live pictures are the most powerful and effective action in the peaceful catagory. We should be sending them out to as many as we can. I find it strange that the folk who agree with defensive action on this forum have almost to a person been the ones who have gotten the I AM A PERSON cards from me. When abortion becomes a fight instead of a debate, we will end it. The best peaceful weapon I have ever used is the I AM A PERSON material. The live images of the womb child simply shut the pro-aborts down every time, and win the hearts of the mushy middle to the cause of Pre-born life. I've seen many ultrasound pictures of zygotes, embryos, and fetuses. I've even seen an ultrasound live and in person. I'm still pro-choice. Pro-abortion is a disgusting view, especially when you still find killing babies okay after you see them moving, living, and everything on screen. I suppose the graphic murder photos of the unborn don't phase you any? No. Photos of abortion don't phase me. Many of the photos of abortions out on the internet are doctored, misrepresented, or completely fabricated, though. That's not true. You just don't want to have to admit abortion kills babies. It's a cowardly lie. Besides, even if they WERE fake pictures, where are your "real" ones? Well then, of course you'll tell us where to find the "REAL" ones, right? NOOOOooooooo?????? You know nothing at all about anything other than proabort dogma and mantras, which you repeat mindlessly. I doubt if the sight of an actual bloody baby's corpse right in front of you would touch your stone cold heart at all. No, I won't admit that abortion kills babies because it doesn't. It "kills" zygotes, embryos, and fetuses. Please notice that I said many (not all) of abortion pictures that can be found on the internet are doctored, misrepresented, or completely fabricated. If you're truly interested in seeing real pictures of abortion then I suggest checking out a medical textbook. Medical textbooks do NOT contain photos of ABORTED babies......... you DIDN'T know that???????????? Fetus is just a term for an unborn HUMAN BEING. They're still human people. And abortion does kill. That is the main intent of the "procedure", to end the life of the unborn. Fetus in latin means little one, and is the same term used for a child wheather born or pre-born. I don't believe the website. What documentation do you have to "prove" those photos are genuine? What point do you imagine that displaying a photo of the dismembered parts of a "5 week old embryo" makes? That is the only clinic supporting abortion that I've ever seen post a picture. Nevertheless, they do it at a conveinetly early stage. At five weeks, the child is very soft and probably just turns to liquid when suctioned. As that appears to be a suction abortion. The time in which abortions are legal go well past 5 weeks, though. Abortions are legal for up to 24 weeks of gestation. Plus, with clinics like Doctor Tiller's, abortions are done all the way up to almost the time of birth. The later the abortion, the more gruesome. To me, it really makes no difference if it's not gruesome, as a person is being killed. However, the person is so early in development, it's not as 'messy'. Any human body will look like so much hamburger if it's ground up fine enough. That appears to be what has happened to this poor unfortunate baby, and this abortuary seems to be proud of their work. According to the CDC chart on Wikipedia, slightly less than 60% of abortions are performed by 8 weeks of gestation. While some abortions occur very early with abortaficients if they prevent implantation, I would assume the good majority of abortions occur after the heart begins to beat, around 18 days. 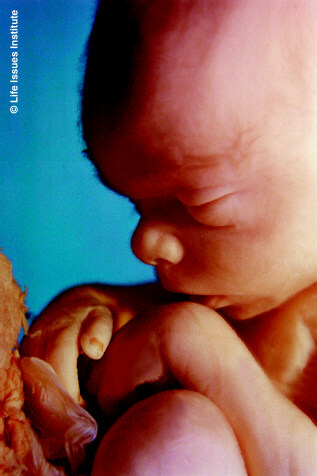 Over 40%, plus the abortions that occur at 7 or 8 weeks, occur when the child has a definite human form, though. Certainly yes. I will say this, at 18 days it is not an actual heart that beats, but a group of blood vessels that will soon become a heart.. Discovery channel "In the Womb" explains this, and even shows a u/s of the vessels beating in unison. 4 weeks.. give or take a few days based on the individual, is when the vessels have merged and create a 'chambered' heart. I'll double check on that gestation.. I believe in givng 100% accurate info to everyone. I am not denying that you will hear a 'beating' at 18 days, but it is vessels that will soon become a heart, not an actual heart..YET. I have not seen that Plan B evidence as I recently looked up the bill and certain forms of birth control, and the information I found said they could act as abortaficients. Just a question, though, and I apologize if this comes across as harsh. Does it not bother you at all, especially in procedures where the child has a definite human form, to see the child moving on the ultrasound, completely safe and content within the womb of his/her mother, and know that you will be doing a procedure to end that childs life in a violent fashion? What if you were within an area where you could not escape and suddenly you were salinized, ripped apart, suctioned through a tube, or halfway delivered and then your brains were sucked out? I just could not imagine doing that to another person or know that I was responsible for the life a very young person dying. Saline aboriton was a style of "L&D", or labor and delivery abortion, which was pretty much discontinued by 1990. D&E suction abortion is now done for abortions to 22+ weeks. It does not bother me, as the only aboritons I have seen past 17 weeks have been for fetal deformity. I am seeing TWO humans though, a fully grown woman with a life, with a family, and SHE wants an abortion. There is a fetus, but IMO she is the 'rule maker'. I see the woman first. CDC states that only 1.9% of all abortions occur after 20 weeks, and the ones I hear about are due to deformities. If there was a 100% effective birth control method that could used by women everywhere, I would be very happy. New research shows that Progestin does not affect the implantation as they previously had thought. The problem with the CDC is the following. I know it is a good source, but not all states are required to report. Secondly, abortions are not permitted in all states or clinics after a certain time period by law, but that does not necessarily mean that clinics don't perform them or skirt around the law. If the law is skirted around, as it is in certain clinics like Dr. Tiller's, then the clinic will not report the abortion for fear of prosecution. I also wanted to add that it's not fair that a child is killed because he/she does or may have a fetal deformity. That reaks of eugenics. My question to you is "So what?" Whatever the status of development in the baby, it is no less a human being because of a lack of development. It's just a very young human being. Are you suggesting that killing young human beings is less immoral than killing older human beings? Actually the heart starts beating at 25 days, but it's close enough. Anencephaly is fatal.. You give birth, and then it dies, if it makes it that far. Each woman has to decide what she can handle as far as disability goes, costs, healthcare etc..
ALL anyone wants is a health baby. YES, it is up to the government to pay for someone's child care who cannot afford it..... they do it all the time. But I'm sure you'd rather see them killed than have to pay taxes to support them, right? i have to also agree that many of the pix are misrepresentations (I have doctored my own pix before) but that does not mean I do not admit abortion kills and I don't think that the PC people feel this way either. They know abortion kills AKA terminates the preg. I think there are so many of these 'late term" pictures out there yes the late terms do not happen very often (as per law) and for medical reasons. I think if the PL movement were to post pictures of the majority of abortions (early) on the sides of vans of bilboards it would look the same as when a woman menstrates. No I have not personally seen the aftermath of an abortion from a nonbiased view but maybe someone has something.......? Ugh and also my taxes go to those who can take care of their own kids and yet still mooch off the goverment. I would much rather my tax $$ go to those who need it vs these loosers who are begging for a hand out. Just because the women feel they can't afford to pay the bills, doesn't mean the child should be killed. The government can and does provide if the parents are unable to care for the child. If the parents don't want to deal with the disabled child, then they should give the child up for adoption as opposed to killing him/her. There are parents or foster parents who will care for disabled infants or children. I realize people want a healthy child, but sometimes that isn't possible. It's not the child's fault he/she is disabled. Well, our lives are not someone else's to take. It's not fair to the child that a parent makes a decision and kills him/her. It's scary to me that a parent says, "My child may die, so I'm having my child killed." What if the medical test was wrong? It's happened before you know. If the child is born and suffers then there are medicines the doctors can give to the child to ease the pain until they can treat the child or the child passes. That's my take on it too. I've never heard of anyone claiming to have "doctored" a picture of an aborted baby before, and I'm 100% sure you do not speak for pro-lifers in general. There is NO NEED to doctor any pictures, many aborted babies are found in trash cans and in sewers! You do us all a disservice by such a silly statement. Why in the world would you even want to do such a thing??? So you're saying kill the babies instead of raising your taxes? Teresa.. AN amniocentesis is 99.4% effective. YES, we can almost with 100% diagnose deformities. The ONLY uncertainty can be when women do not have tests..
AAAAHHH the putrid stinch of pro-abort skank. Makes dead fish smell sweet. Perhaps the amniocentesis is often accurate, but sometimes these tests find health issues that are treatable or conditions and oppose to seeking treatment or continuing the pregnancy, the mother then aborts the child. The ultrasounds can be wrong, though, and they are more than the amniocentesis. A child just died in Italy (I think that's the country) because they suggested there may be a fetal deformity. The mother refused further testing, and she ordered an immediate abortion. The child came out alive, and the child was basically healthy, but he was too premature to survive. I've heard of other such cases or poeple who have had testing and their child has been fine. The bottom line, these tests are ok if used for treatment, but if they are used to kill an unhealthy child, they are wrong. OUT of curiosity, do you know how to debate? dosen't matter one way or another. Skanks, especially the pro-abort kind, have absolutely nothing to say worth hearing. All they deserve is lethal injection like all murders. You don't get to define anything skank. I am for the protection of inocent life. If that means an evil aggressor needs taken out, so be it. When God tells your heart to stop it will. That could very easily be tonight. Then you baby killling skank ways will not serve you very well. While I disagree with FM, I have to say that pro-life ONLY means anti-abortion, nothing else. Technically speaking, if you believe differently, you must also believe that in order to call yourself pro-choice you must be for ALL choices. Pro-life is for the abortion debate, just like pro-choice is for the abortion debate. That pro-lifer was pro-life with other different beliefs, and altho I respect pro-lifers who are against all deaths, it's still incorrect to say pro-life means against all death. Wouldn't pro life mean against all MAN made deaths?? OTHERWISE, what is wrong with euthanasia? AS long as someone of sound mind requests it.. MOST PL'ers I know are against euthanasia..
That might be a good term to use. Although, according to the dictionary, the term strictly refers to issues of abortion. Personally, I'm opposed to assisted suicide/euthanasia and capital punishment in most cases. I consider myself all around pro-life. I'm against abortion and euthanasia. Then "they" were fools and you were a fool for believing them. I disagree with bombing clinics. No, I am not a fool.. BUT EVERY OTHER PL person I have met has explained to me that their "PL Views" encompass many ideals..
"Views" do not constitute valid definitions, now do they? Have any "PL people" on this forum misled you? Twisting words to mean what is convenient to you is a favorite trick of proaborts, as evidenced by your universal disdain for dictionaries. If it were a killing center for the already born chld would you disagree with it being bombed? Is it the bomb thing? How about just burned down? I wouldn't even condone bombing killing centers for the born, or even nazi concentration camps! I'm not for bombing ANY PLACE. Many news articles over the years, and one poster on this forum... Robert Ferguson. And links to the many news articles? I'm quite interested since any reputable clinic that provides abortions follows health codes and disposes of the remains of abortion according to those health codes. The current method being incineration, I believe, NOT dumpster or trash can disposal. Law abiding abortuaries may use "current methods", others do not. You can google for the newsarticles as well as I can. It is YOUR burden to provide proof to back up YOUR statements. You were the one that originally stated, "There is NO NEED to doctor any pictures, many aborted babies are found in trash cans and in sewers!" When you say things like this, YOU are the one required to furnish the proof, not I.
thought; at least he didn't kill for money! not require pretesting or the identification of cosmetic ingredients. shampoos and five hand creams all contained collagen. questions about respect of life and ownership of the placenta. abundant source of fetuses for commercial use. third profit is from unsuspecting customers buying cosmetics. buy a TV set and cookies and soft drinks for visiting professors. Personally, I hope that they choked on the Kool-Aid! them since it disturbs the patients. realized that they could make another profit out of them?
. Well, "Richmond's shame" marked a new low in disposal of wastes. bags and thrown on top of the bin. advertises "celebrating a decade of service." Federation and the Florida Abortion Council. sidewalks of several abortion clinics in New York." the city dumpster prior to closing every night.
. He nearly died of shock. I nearly did too, reading about it. They Burn Babies, Don't They? in furnaces at the sites of their deaths. burning babies," as if that was routine. dedication amid such a contradiction! first time they saw it.
. "It's dolls, It has to be dolls," said the kindergartner. "No,"
reward was offered for the arrest of its killer. $60,000 in the last one and one half years to enhance outdoor ethics. mandatory state funding of abortions! where it would be safer than at the mercy of the Health Department. human fetuses is because they are human, not animal. four walls of the same coffin. through their skins. They couldn't. for shipment to experimental labs. the availability of pancreases from later term aborted fetuses. with cells from aborted kids. o Brain cells would be "harvested" from aborted babies for transplant. 100,000 fetuses are sold to drug companies each year in the U.S.
the need for anesthetic, saying an aborted baby is just garbage." were kept alive for months. o Even the baby's placenta is sold for 50 cents to drug companies. Ever heard of Placenta Plus shampoo? source of spare body parts? for organs. It's enough to make you tear up your organ donor card! spare parts department but Little Bugger cannot! or the Year of the Disabled? don't walk, to your nearest prayer closet and start praying!
. SYSOP's note: Everything you have just read is quite true. Dr.
A.L.L. About Issues Magazine, P.O. Box 490 Stafford, Va. 22554. I have not heard of anyone admiting to it either. I wonder if the aborted babies you are talking about are some of the ones who were actually delivered then the mother dumped them???? Why should a picture of a late term abortion be used for a woman having an early abortion? Why not just give her the facts of what is happening when she aborts, show her maybe sonogram pictures? I reposted my comment and that should answer your question. I think you read it incorrectly. The moochers, those who have jobs drive new cars and lie on taxes to get extra$$ and get gvt health care, food stamps, free housing exc. Those who need it, the mothers who feel they need to abort d/t not having any money???? The parents working 2 jobs struggling to get by??? So why have people found dead children in jars in dumpsters and alleys? But still, why treat them are "waste"? They're HUMAN BEINGS, they deserve to be respected as such. Give them funerals, something, anything but "dispose of them" like clinics do. Actually, don't kill children at all! How's that? The only thing truthful about your post, is when you admit to being a skank. How you can tell when a pro-abort skank is lying is when their mouth moves. So I thought intact was all the "parts" were still together (unlike the vaccume where the body is mismembered) So I did a little research and I am still unclear of the hysterotomy procedure for abortion. I found on one page "The doctor cuts the umbilical cord in-utero and waits seven minutes. The baby dies and is then delivered. " I also found "In the case of a hysterotomy the uterus can be opened up and emptied of the live fetus and its placenta and membranes. A hysterectomy involves removing the entire uterus, with the fetus and the placenta and membranes"
severed heads??? a cut off head?? kept alive for months?? how?? However there is clear proof that abortion is killing the fetus inside you, we can also very easily get proof of this. Or tell them the baby has a heart beat and is able to move exc. all things easily prooven and true...unlike using babies for shampoo...??? who came up with this???? The best all round info to educate folk about abortion is the I AM A PERSON card. Which I will send a sample to you for free. were kept alive for months." Dr. Harold O.J. Brown later explained in Human Life Review that "the third study described involved the decapitation of well-developed human fetuses and the artificial maintenance of the severed heads for a certain period by attaching them to an apparatus that perfused them with blood containing the necessary oxygen and nutrients" (italics added). Of course the media made no mention of fetal experimentation, in utero or ex utero. They had already circled the wagons to defend Roe v. Wade. where in the world did you find that? "To the King's surprise - this egg, with no head, no mouth to be fed and no legs, cracked just past sunrise! Thus, the King was fed in the head with the thought of knowing, from this egg, thought of as dead - a chick was growing!" That's not the purpose of such visual aids. We already know it is wrong, and so do most proaborts. The only question remaining is "Just HOW wrong is it?" That's where the visual aids come in. By seeing a live unborn baby, and then seeing a dead aborted baby, we get a much more personal sense of the moral wrong involved. A picture is worth way, way more than a thousand words where right and wrong are concerned. You can put people to sleep with a long, detailed discussion of why abortion is morally wrong, but a few photos can wake them up.